Shaykh Kamal El Mekki has been dubbed the Black Belt of Dawah. With decades of experience in the Dawah scene, Shaykh Kamal combines his ground-breaking teaching style with his own dash of humour, certain to leave students feel at ease and entertained, but above all skilled and empowered. Shaykh Kamal is known best for his workshop ‘How to Give Shahadah in 10 Minutes’, a 6 hour workshop designed to empower MSAs and Dawah organizations in the art of Dawah. 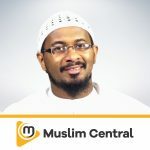 His lectures and online videos (targeting contemporary challenges) have also gained popular fame and positive impact among Muslims and non-Muslims alike. Educated at the hands of numerous prominent Islamic scholars from across the world, Shaykh Kamal also has dynamic experience in the secular world. Discover more series by Kamal El-Mekki.